Libreville is the heart of Earth's multi-world civilisation. With the base of the Beanstalk located inside the mega-city it links humanity to the far-flung colonies. It is home to the largest maritime port complex on Earth, and air and spaceports dot the nearby Gabon countryside. It is also a corporate haven as every major commercial enterprise and foundation on Earth has an office in Libreville. Residential enclaves for the elite surround a city core of luxurious excess. However, Libreville, like all the cities in French Africa, is also ringed by kilometres of slums. While France is happy to accommodate the Transnational Corporations that wish to utilise the Beanstalk, the millions of unemployed and low-skilled workers have yet to see their conditions improve. 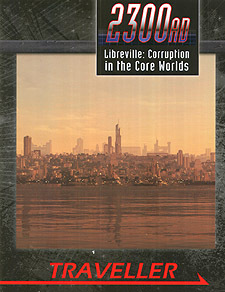 Libreville: Corruption in the Core Worlds is a sourcebook and adventure for 2300AD. It outlines the history and geography of Gabon and Central Africa along with the culture, fringe societies and seedy politics of Libreville. The adventure, Mud Sticks, takes the players through the cosmopolitan downtown into desperate Mudville as they investigate an outbreak of violence in the sums. This book also includes sample vehicles, spaceships, robots, non-players and random encounters relevant to Libreville.